Select either 2.4GHz or 5GHz from the drop-down menu. Select Access Point from the drop-down menu. The other three choices are WDS with AP, WDS, and Wireless Client. Service Set Identifier (SSID) is the name designated for a specific wireless local area network (WLAN). The SSID’s factory default setting is dlink. The SSID can be easily changed to connect to an existing wireless network or to establish a new wireless network. The SSID can be up to 32 characters and is case-sensitive. Enable or Disable SSID visibility. Enabling this feature broadcasts the SSID across the network, thus making it visible to all network users. Enabling this feature automatically selects the channel that provides the best wireless performance. Enable is set by default. The channel selection process only occurs when the AP is booting up. All devices on the network must share the same channel. To change the channel, first toggle the Auto Channel Selection setting to Disable, and then use the drop-down menu to make the desired selection. Allows you to select the channel width you would like to operate in. Select 20 MHz if you are not using any 802.11n wireless clients. Auto 20/40 MHz allows you to connect to both 802.11n and 802.11b/g or 802.11a wireless devices on your network. Use the drop-down menu to choose Open System, Shared Key, WPA-Personal, WPA-Enterprise, or 802.11x. Select Open System to communicate the key across the network. Select Shared Key to limit communication to only those devices that share the same WEP settings. If multi-SSID is enabled, this option is not available. Select WPA-Personal to secure your network using a password and dynamic key changes. No RADIUS server is required. Select WPA-Enterprise to secure your network with the inclusion of a RADIUS server. Select 802.11x to secure your network using 802.11x authentication. In WDS with AP mode, the D-Link DAP-2553 wirelessly connects multiple networks while still functioning as a wireless AP. WDS with AP mode is selected from the drop-down menu. Service Set Identifier (SSID) is the name designated for a specific wireless local area network (WLAN). The SSID’s factory default setting is dlink. The SSID can be easily changed to connect to an existing wireless network or to establish a new wireless network. Enabling this feature automatically selects the channel that will provide the best wireless performance. This feature is not supported in WDS with AP mode. The channel selection process only occurs when the AP is booting up. Enter the MAC addresses of the APs on your network that will serve as bridges to wirelessly connect multiple networks. Click on the Scan button to search for available wireless networks, then click on the available network that you want to connect with. Use the drop-down menu to choose Open System, Shared Key, or WPA-Personal. In WDS mode, the DAP-2553 wirelessly connects multiple networks, without functioning as a wireless AP. How to configure the D-Link DAP-2553 AirPremier N Dual Band PoE Access Point for VLANs? 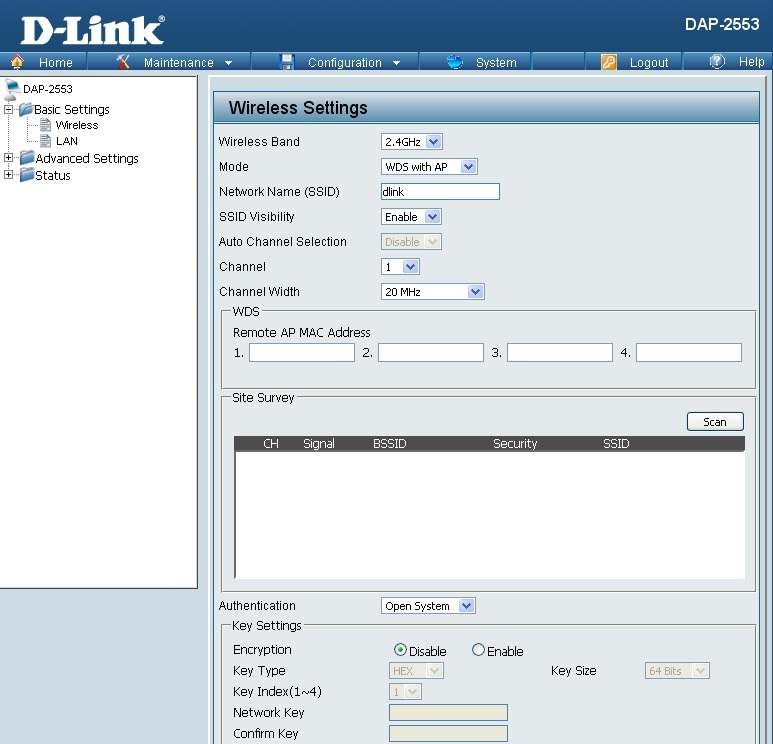 How to configure the wireless settings on D-Link DWL-G730AP? How to connect DWL-520+ or DWL-650+ wireless card to an Access Point that has the Broadcast SSID disabled? 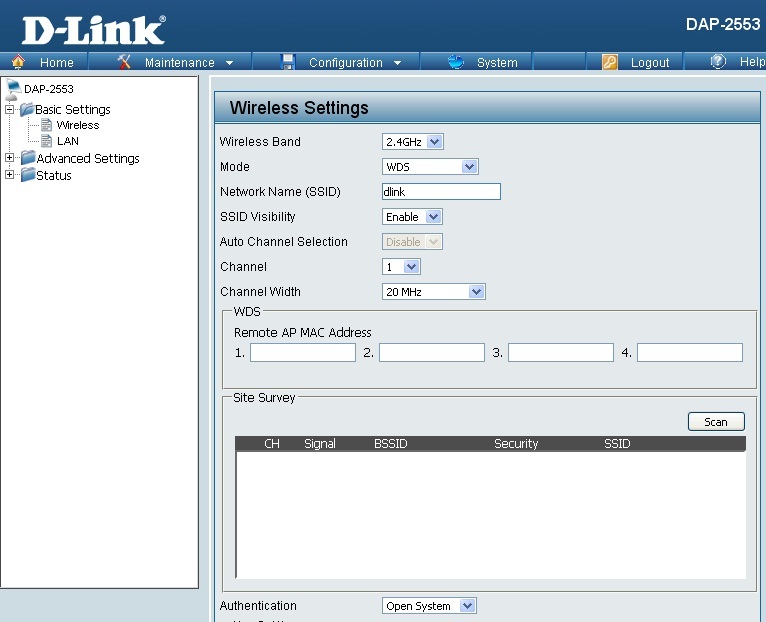 How to change the wireless mode and channel of D-Link DWL-2210AP? 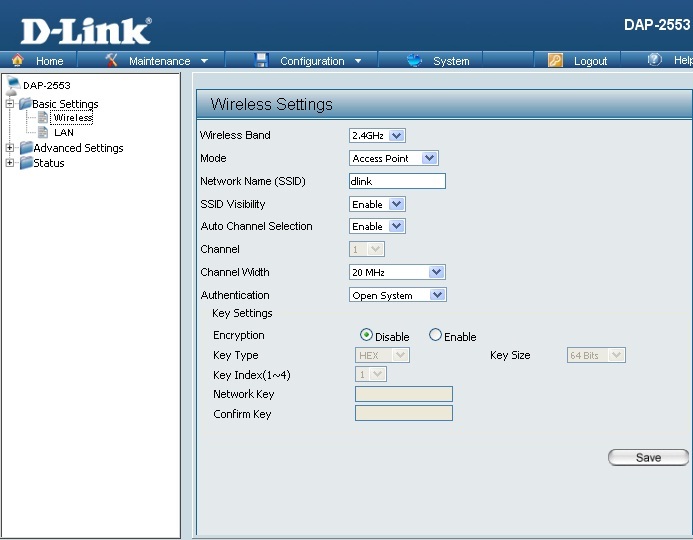 How to change security settings on D-Link Draft 802.11n Wireless(DWA-142)? How to enable Super G™ Mode on D-Link DWL-2100AP, DWL-2200AP, or DWL-7100AP? The channel width selection on my DAP-2553 is greyed out. Is that due to some other selection I’ve made, and if so, what?